DTBird’s ability to detect and deter large raptors, particularly golden eagles, and to reduce the risk of collisions with wind turbines (WTG) was evaluated in the USA by H.T. Harvey & Associates for the American Wind Wildlife Institute. The evaluation was carried out in 7 DTBirdV4D4 units installed in 2016 in a California wind farm, using eagle-like unmanned aerial vehicles (aka, UAV) with a 2 m wingspan, and studying in situ large raptor behavior registered during 2017. Up to 99%1 Overall eagle-like UAV Detection rate from > 230 m to the Rotor Swept Area (RSA). 63% mean Detection rate per distance band of 30 m (7 distance bands from >230 m to the RSA). 2.5 False Positive rate (flight recording of something other than birds)/WTG/day2. To see the original report with DTBird notes, please go to this Link. 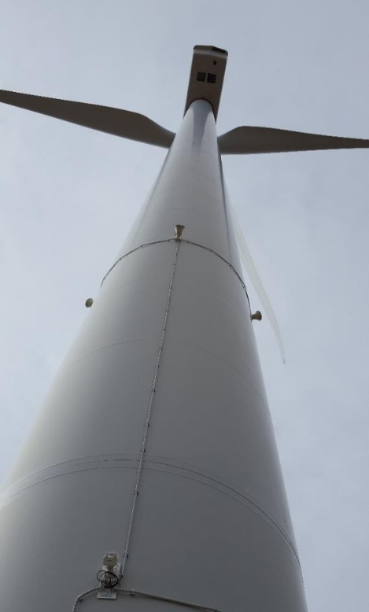 DTBirdV4D4 unit installed at Manzana Wind Power Project. 1 DTBird calculation for a flight path from >230 m to the RSA, through 7 distance bands with the mean detection rate presented in the Pilot Study (figure 19, page 51; DTBird note on the same page gives calculation details and online access to these calculations). Lower overall detection rates or even no detection is expected under specific conditions (e.g. flights entering the surveillance area at less than the maximum detection distance, or flight paths through sun glare areas). 2 The FP rate has been calculated by DTBird with the data provided in the Pilot Study, as detailed in DTBird note in epigraph: 4.1 DTBird Targeting Efficiency, page 58. 3 Including the potential interacting effect of the spinning blades, that requires a controlled experiment to be isolated. 4 Maintenance Summary provided by DTBird, located in table G1, pages 84-86. After several months of preparation, the new offices and assembling facilities have started full production. The space has been doubled to more than 600 m2 and the staff has grown to over 20 technicians that are working on research, manufacturing, and providing technical support to over 100 DTBird&DTBat operational units. This expansion will make it possible for us to install over 100 new units during the next six months in Austria, France, Germany, Greece, Spain and the USA. DTBird&DTBat technicians presented the latest models with upgraded features to over 50 companies and public organizations. They also discussed the results of the latest evaluation of DTBirdV4D4 (model 2016) in the USA. Currently DTBird is operating in 2 onshore wind farms in Germany and it is scheduled to be installed in another wind farm in the following months. Additionally, DTBird has been operating in the offshore Platform FINO 1 for over 2 years. DTBird&DTBat stand at WindEnergy Expo in Hamburg. DTBird System Brochure. September 2017. DTBat System Brochure. September 2017. DTBird System Specifications for Wind Turbines. November 2017. Poster. Evaluation DTBird Collision Avoidance Module models 2014-2015. DTBird System Evolution. Jan 2016. DTBird Factsheet Bird Collision Probability. Sep 2015. DTBird Factsheet Bird Monitoring Onshore. Sep 2015. DTBird Factsheet Bird Monitoring Offshore. Sep 2015. DTBird Datasheet Bird & Bat Monitoring at Met Towers. Oct 2014. DTBird Case Studies Shutdown On Demand. Mar 2014. DTBird vs. Radar. Jan 2013. DTBat System - Specifications for Wind Turbines. May 2016. DTBird ® & DTBat ® are registered products owned by Liquen Consultoría Ambiental S.L., and the website is available for public use at this URL. In accordance with the provisions of the current legislation on Personal Data Protection, we inform you that the personal information you have provided us will be incorporated into the processing system owned by Liquen Consultoría Ambiental, SL, with Tax ID number ES-B83521732 and its registered office at Av Democracia 7 28031, Madrid (Spain) in order to facilitate, attend to and meet the commitments established between the two parties. In keeping with applicable regulations, Liquen Consultoría Ambiental, SL informs users that their information will be kept during the necessary period in order to fulfil the aforementioned conditions. Liquen Consultoría Ambiental, SL also informs its users that it will process the data in a lawful, honest, transparent, suitable, relevant, limited, accurate and updated manner. Liquen Consultoría Ambiental, SL therefore undertakes to take all reasonable measures to ensure that they will be deleted or modified without delay if they become inaccurate. You can contact the competent Control Authority to present the claim that you consider timely. These cookies are gathered and managed by a third party and cannot be considered our own cookies. Third parties Analytical cookies (google analytics). Google Analytics: Stores cookies in order to be able to generate statistics on traffic and number of visitors to the website. Your use of this website constitutes acceptance of your information being used by Google. As a result, in order to exercise any of your rights in this regard, you must contact Google directly. In addition, LIQUEN CONSULTORIA AMBIENTAL SL informs that you have the option of configuring your browser so that you are informed of the reception of cookies, allowing you to prevent these cookies from being installed on your hard drive if you wish. With DTBird & DTBat newsletters, Liquen Consultoría Ambiental keeps the users previously subscribed, updated about DTBird® and DTBat® Systems: upgrades, new features, new projects, participation in exhibitions and conferences. We inform you that the personal email address and the information you have provided us will be incorporated into the processing system owned by Liquen Consultoría Ambiental, SL, with Tax ID number ES-B83521732 and its registered office at Av Democracia 7 28031, Madrid (Spain) in order to facilitate, attend to and meet the commitments established between the two parties. In addition and in keeping with what is established in Article 21 of Law 34/2002, of June 11, on Information Society Services and Electronic Commerce (LSSI-CE), we also request your express consent to send you publicity on our products that we think may be of interest to you, whether via email or by any other equivalent means of communication. At first, at the end of 2015, DTBirdV4 started operating in the offshore Platform FINO 1, over 40km offshore in the North Sea, contracted by the Bundesamt für Seeschiffahrt und Hydrographie (BSH). This year the models DTBirdV4D8 and DTBirdV8 have been installed for the first time in onshore wind turbines in Lower Saxony and Bavaria. DTBird will participate in the following events, the first one giving the guest lecture of "Field Ornithology" at the University of Applied Sciences Weihenstephan-Triesdorf on April 10th. In the second event DTBird will attend WindEnergy Hamburg at hall A1, stand 203 on September 25-28th. DTBird models installed in onshore wind turbines, Germany.